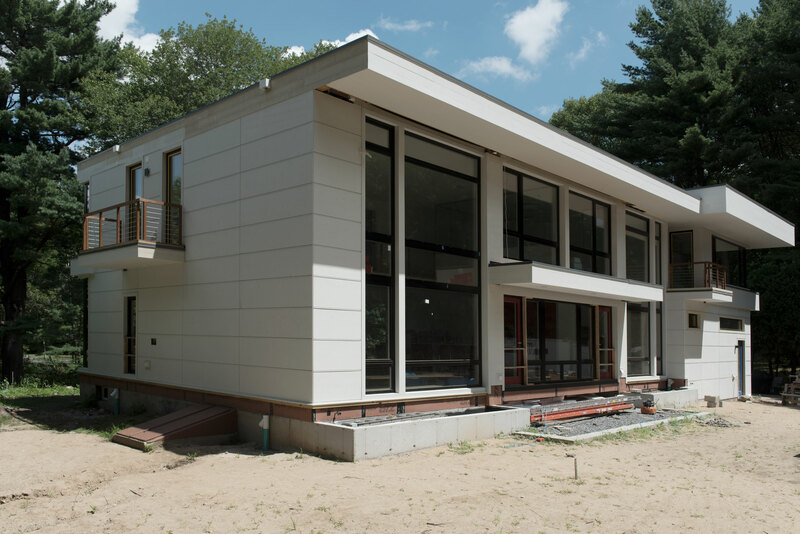 This residence is a new construction project in Lexington, MA, designed by Oldenburg Architecture and built by Lipcon Construction. 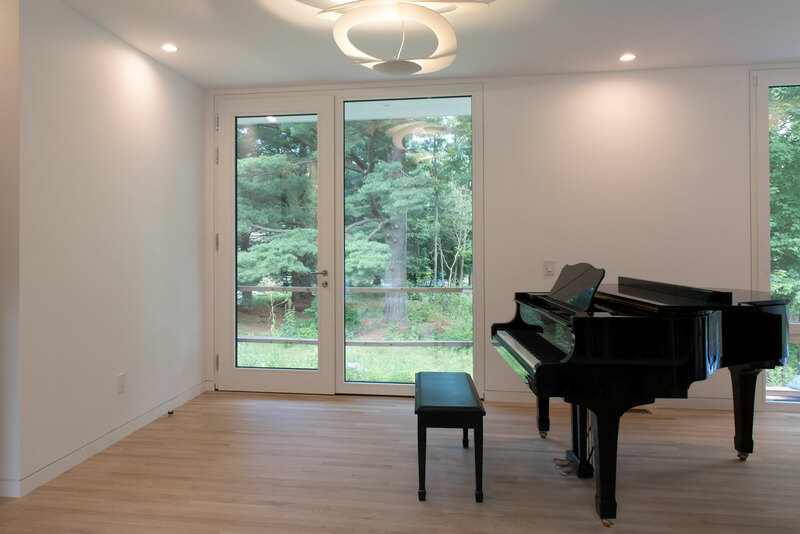 Surrounded by natural woods, the house lives up to a modern & minimalist design style, with Dutch painter Piet Mondrian’s color palate and composition methods as an influence. Flat cantilevered roofs, and extensive glass surfaces maximize natural light in such a private location. To increase the flow of natural light, and air into spaces that are heavily shaded by thick foliage, the Oldenburg Architecture team envisioned large windows that vary in size and operation; they would include various customized windows, including mechanically and manually operated hopper windows. 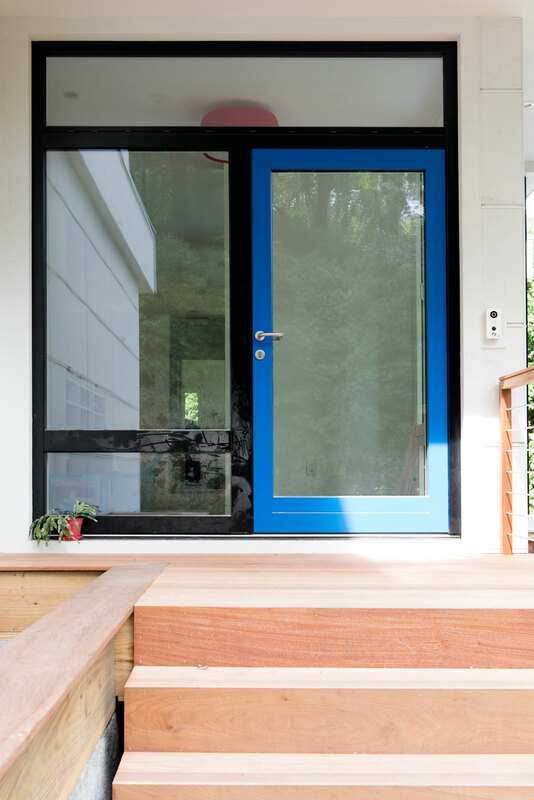 The Mondrian inspiration pushed the client to request primary colors (Red, Yellow, Blue) on the exterior doors of the house. The project also included several conditions which would require corner mulled window units to be assembled in the field. 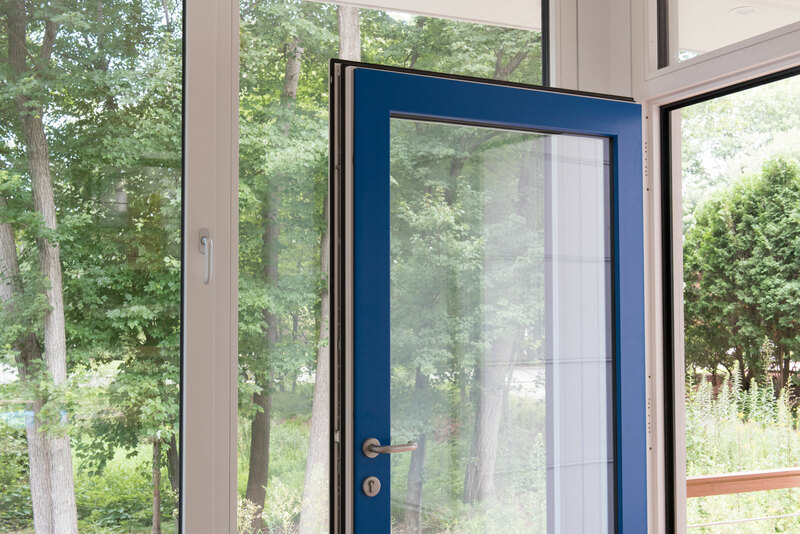 To maintain a comfortable ambient temperature inside the residence with the large glass to wall ratio, the windows would need to be engineered to Passive House standards - international high-performance construction and design standard. The first challenge was to engineer a window that would perform as needed. 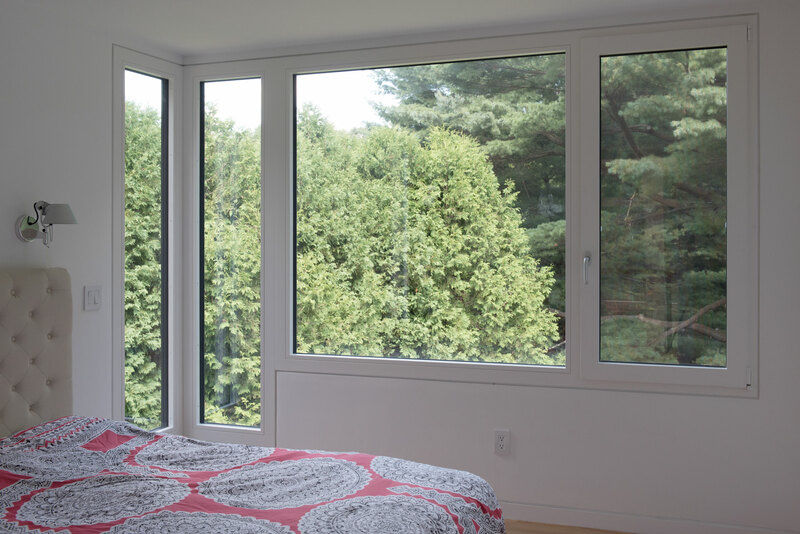 With over 1750 ft2 (160 m2) of glass, the average U-value of all units was 0.15 – meeting the passive house, comfort level, in the Massachusetts climate zone (Climate zone 5). The Solution was to implement triple pane, argon filled, aluminum clad windows and doors, the glass to frame ration allowed for the window to have such a low overall U-value. The Architect followed the Mondrian inspiration with a specific interior and exterior window finish schedule – the interior wood frames are painted pure white; and the exterior cladding is black anodized-aluminum on the windows; with yellow, red, and blue anodized-aluminum for the doors. The next challenge was to engineer two, separate multi-window systems, 18.5 ft tall, that could be transported in a 40’ high cube container, easily assembled on site. The multi-window system included fixed windows, with manually operable windows, and extra-high electronically operated hopper windows. 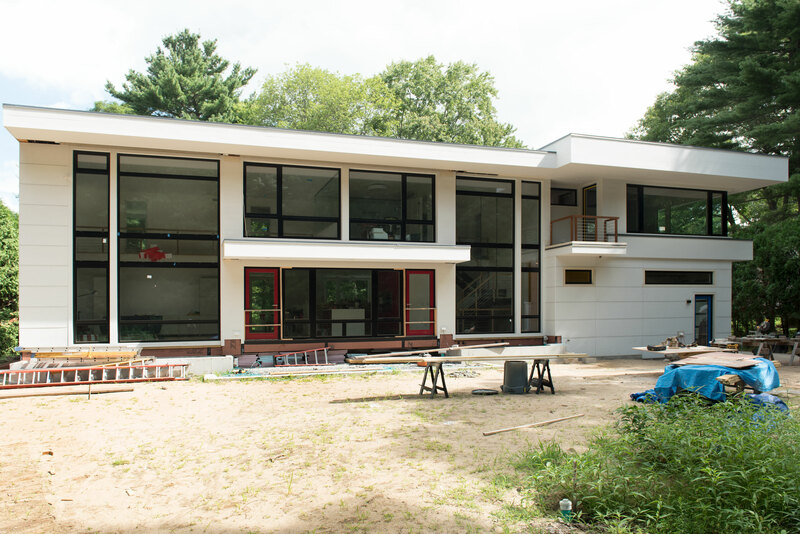 The house was designed to include a mezzanine and an open double height area, this meant that we had to assemble and install a 10 feet wide and 18 feet high window system, which could be transported and mulled in the field. Further, the cantilevered structure presented a different challenge, one much more specific to this project. When creating the structural steel frame, it was decided to include small structural steel tubes at the corners, onto which we had to install 7 different corner windows. This meant that we had to set the windows around them. 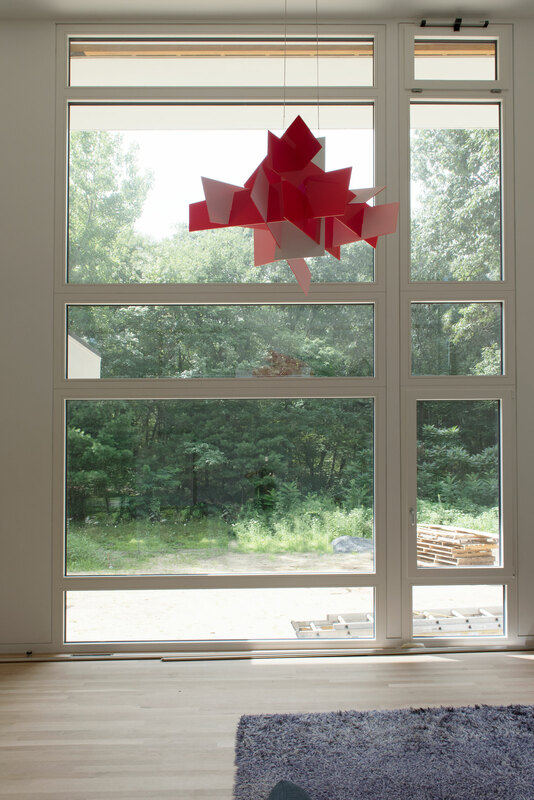 Because they were all aluminum clad windows, this corner detail disturbed the way in which the windows fit together – there was a separation between the aluminum clad corners which revealed the underlying solid wood frame. To solve that problem, we custom made aluminum pieces from sheet metal bent to profile. The final challenge came as a change in the projects design during the window installation. The southern façade of the house was reconsidered, and our client decided to change the site-line of the mullions. Fulfillment of this request, with the immediacy required for the projects schedule, required extensive modification in the field. Eco Supply's background in architectural woodworking enabled us to set up on site to make these modifications. Modifications included disassembly and reassembly of a large window wall to factory specifications. Because of our excellent team of engineers, we were successful in providing a window system that can outperform any windows bought off the rack; in addition, the flexibility in customization that Bildau & Bussmann can provide on finishes, accessories, and systems allowed the client and the architect to achieve its vision aesthetically, as well as easy operation. 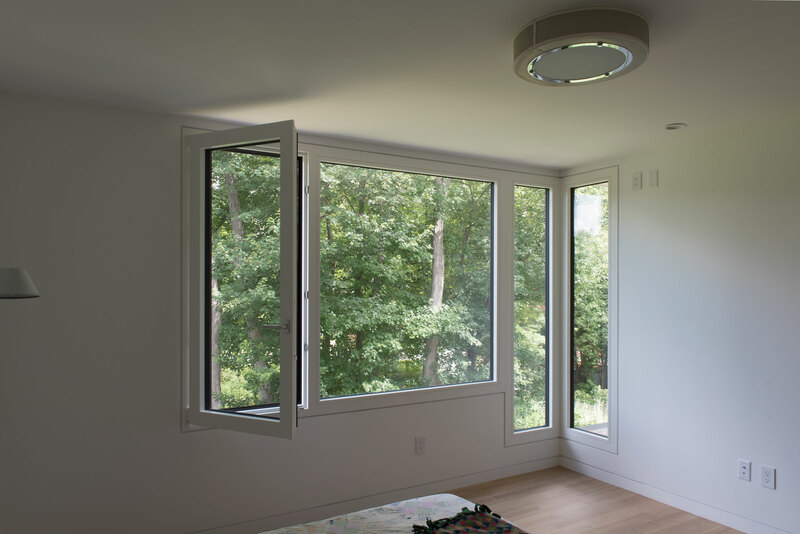 The performance values of the Bildau & Bussmann window system will maintain the comfort level of this home through the seasons allowing the sun to warm the space in winter, and keeping the house cool over the summer without compromising on stunning views off the lush green landscape the house is set in. Lastly, Eco Supply’s biggest success with this project comes through the problem-solving abilities of our installation team. Our main effort is to provide the best solutions for our clients; being able to use ingenuity by crafting custom aluminum sheets on site to mask steel structures and finish them to blend in seamlessly with the aluminum cladding of the windows, or assemble multi-window systems, and fully re-arrange parts as necessary to achieve the desired look.